The old adage, 'If it ain't broke, don't fix it,' probably best applies to Germany's Helldorados and their second album, Lessons In Decay. This could be the second half of their debut album, or merely a collection of songs that didn't make the cut. That's not necessarily bad. Consistency is a good thing. Yet, if anything, listening to this album, I got the feeling that the Helldorado sound has become more polished. There was something rough, but neither raw or shoddy, about the first album. Some of that seemed to come from their latent nod to Eighties sleaze. Alternatively, while there's definitely some heaviness and spark, the band sounds bright and shiny like rinsed every song in some sanitizer after recording. But Helldorados still produce some catchy hard rock with groove, melody, and catchy hooks. There's quite a few faster songs here that, if the pace was quickened another notch or two, could reach speed metal such as To Live Is To Die, Let Us Play, and Mealomaniac. Also, there aren't any ballads this time around, where there were two last time. The closest thing may be Anytime, Anywhere, but it moves more like an AOR arena anthem. Another song, We Won't Back Down, suggests, by it's title, a tough hard rock fist-pumping anthem, but again comes across mild and polished. Finally, I remember Helldorados being funnier with some tongue-in-cheek, rock n roll humor. There's no song like Got Laid on this album. While there's definitely much to enjoy here, I still felt something was missing. Call it edginess, grit, or more of that spit in your face rock attitude. Having said that, I suspect that when played live these songs capture that edge and attitude. Nevertheless, as said at the start, if you liked the first album, this one fall right in line with it. 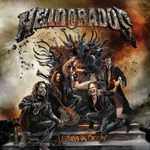 Helldorados' Lessons In Decay is basically their debut album part two, catchy melodic hard rock, but with no ballads.